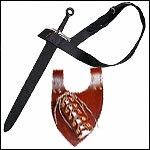 Leather Sword Back Slings - You've seen it in movie epics and in books. An easy way to carry and more importantly, draw your Sword while it's on your back. Leather Baldrics - The baldric was a favorite way to wear a sword since biblical times, the use of the baldric continued into the 17th century. Quality Leather Sword Frogs - Quality Leather Sword Frogs for suspending Sword and Dagger Scabbards from a Sword Belt. Leather Rapier Carriers - Made to carry a rapier correctly and securely. Sword and Dagger Scabbards - Our leather scabbards can be made to fit most swords and daggers. Scrap Leather from our Leather shop sold by the pound. Heavy 13 - 15 ounce leather and Light 7 -10 ounce Leather in natural. Copyright © medievalandrenaissancestore.com 2019. All Rights Reserved. Your wish list is currently empty. Add anything you like here to remember what you would like to buy in the future. We hope you enjoy the wish list. Come back often.